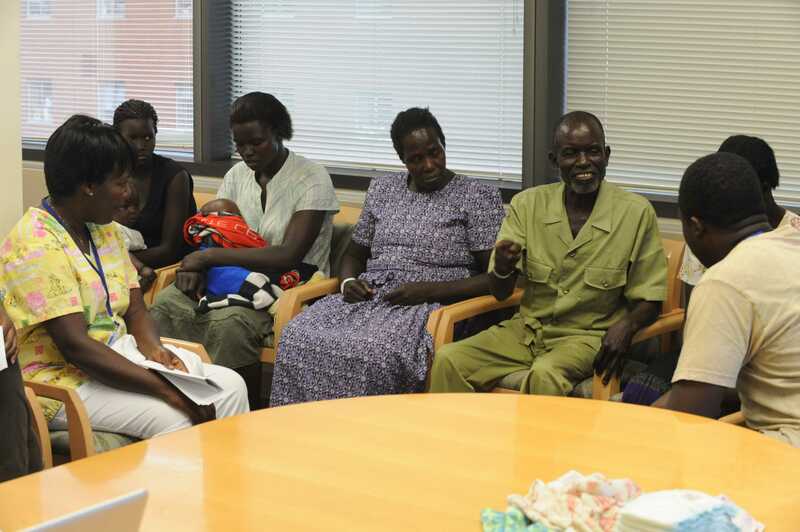 Caption: From left, translator Irene Nakamya; Alice Alanyo and infant son Hassan Komakech; Concy Lamunu and infant son Jovan Lokpol; Balbina Lamon; Domasco Okenyy; and translator Tom Azalia during the Ugandan family’s visit to the NIH Clinical Center in May 2014. In 2012, NIH researcher Avindra Nath traveled to Uganda to investigate a mysterious illness striking children between ages 5 and 15 in Acholi—a remote region in the north of that African nation. More than 3,000 children in Acholi and villages in nearby Southern Sudan were suffering from “nodding syndrome.” Named for the drooping, or nodding, head typically seen in patients, the condition is characterized by seizures, staring, and varying degrees of mental retardation. Dr. Nath, a neurologist and clinical director at NIH’s National Institute of Neurological Disorders and Stroke, and Dr. Thomas Nutman, an expert in parasitic diseases from our National Institute of Allergy and Infectious Diseases, along with experts from the Centers for Disease Control and Prevention (CDC) and the World Health Organization, have joined with experts in Uganda to try to identify the cause of this disease. If you are wondering why the NIH would be interested in a mysterious syndrome seen in this region of the world, it is because any disease that spreads rapidly is a global threat. Although CDC studies had ruled out the possibility that a toxin or infectious agent alone directly caused nodding syndrome, Dr. Nath decided to investigate whether infection with a parasitic worm called Onchocerca volvulus might trigger changes in the bodies of these children that set the stage for the disease.